It is interesting to note how the first generation of three-wheeler cars was more or less obsolete by the end of WW1. Some manufacturers blamed the motoring press for accelerating their demise. There certainly was much speculation on the subject in the motoring magazines. 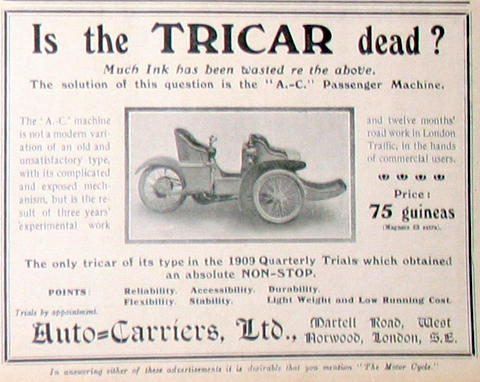 Auto-Carriers Ltd, the precursor of the company A.C, made one of the successful models, but most tricars produced could not be updated fast enough for the increasing demands of the motoring public. Informal clubs had been established quite soon after the first cars came onto the market. They provided essential support and sharing of information, much as our vintage car clubs do today. 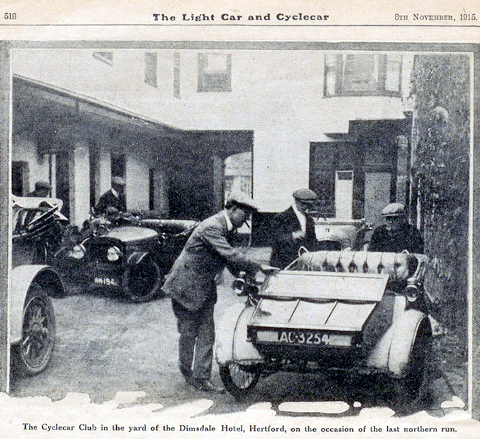 The Cyclecar Club came into being on 30th October 1912 and held its first race meeting at Brooklands the following year. On 1st April 1919 the Cyclecar club changed its name to the Junior Car Club. 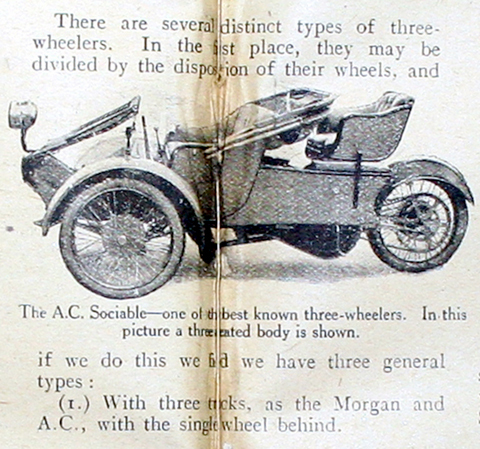 Three-wheelers have, throughout their subsequent history, remained very much a niche market and only Morgan and Reliant have enjoyed long-term success in 3-wheeler production. Much has already been written about the cyclecar’s descendant – the postwar three-wheeler, microcar and bubblecar – but there has not been much focus on these early ancestors. So few of them are now on the road that motoring enthusiasts rarely see them first-hand. Values of veteran cars put them out of the reach of most vintage hobbyists. And three-wheel cyclecars became obsolete for good reason – they were slow and cumbersome to drive. My Warrick’s top speed is 18mph. Veteran tricars rarely get an outing beyond the Pioneer Run. Most are in museums, where it’s not easy to appreciate the ‘essence’ of them. Like mechanical beasts, they splutter, rattle and judder. While pumping their oil feed, you have to hold on tight to steering wheel, handlebars or tiller despite a top speed of around 15mph. Tiller steering is not the most efficient means of bypassing obstruction. Wherever you are, they seem to launch themselves into (and, you pray, out of) every pot-hole for miles around. 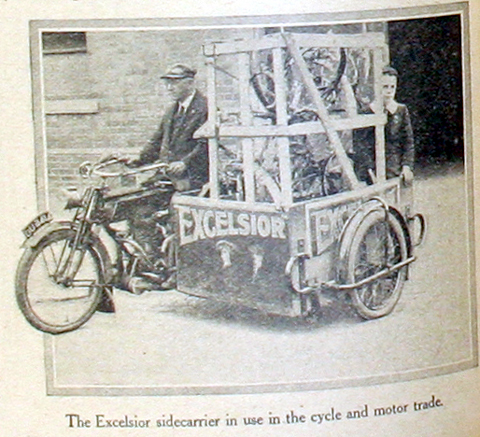 Though information from nearly 100 years ago is scarce, John Warrick & Co provides a good example of a small manufacturer of three-wheelers in the early 20th century. The details published here represent many months of research. I hope this website will inspire anyone with further information about this innovative manufacturer to get in touch so that the name of John Warrick may be preserved for posterity. 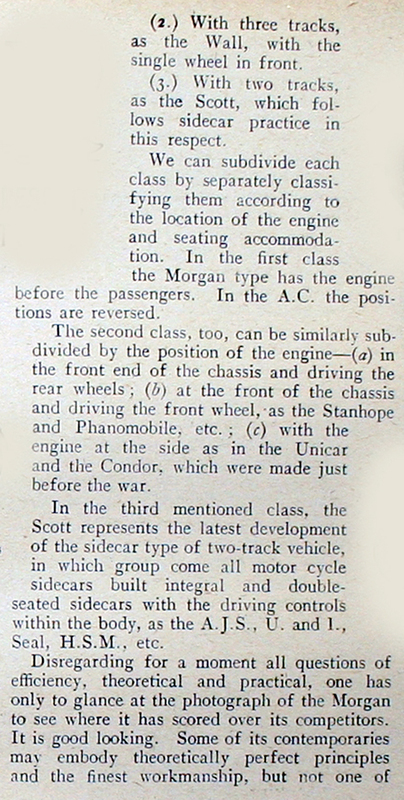 The article below, dated September 1918, sums up the demise of the first era of the three-wheeler. The Warrick Motor Carrier was not mentioned here. Several other models are also not mentioned. 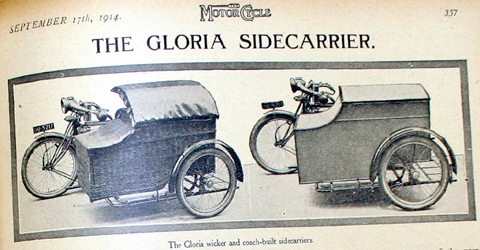 The article is a summary of various styles of cyclecar, and obviously the Warrick is almost identical to the AC. 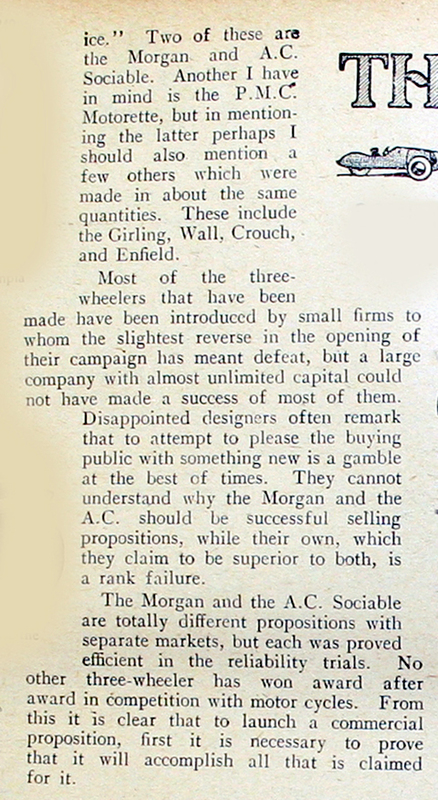 The AC company also advertised frequently in ‘The Motor Cycle’ and, as there was obviously friction between AC and John Warrick, I wonder if this had a bearing on editorial content? When you examine these pictures of some of the motorcycle combinations that became available by WW1, you can see why the early tricars became obsolete. It was not just their increased speed and improvements in design (eg clutch and kick-starter), but it was essentially down to the configuration of the wheels. A 4-wheeled car is generally big enough to bump its way over pot-holes. A motorcycle has its wheels in line so can negotiate around them. A motorcycle with sidecar is double-tracked and can just about handle pot-holes if it hits them. However, as anyone who has driven a postwar microcar will attest, a tricycle with a 3-wheel track tends to be a magnet for pot-holes. Of course, the other advantage was that you could choose a sidecar to fit your existing motorcycle, and it could be removed if you wished to use the machine for solo work. Top left is a chimney sweep on his 8hp Chater-Lea. 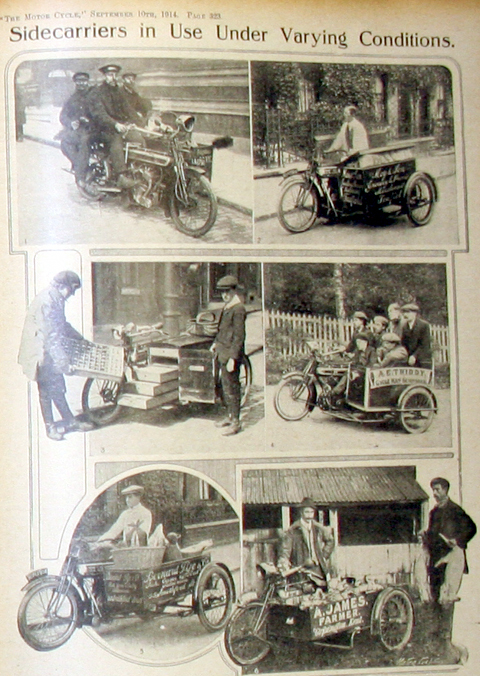 Top right, a grocer on his round with 6hp Rudge. Middle left, the carrying of eggs illustrates the efficiency of springs. Middle right, 6 up on a Premier climbing a Kentish hill. Bottom left, a game dealer with his Rudge. Bottom right, a farmer loading his Ariel Sidecarrier. 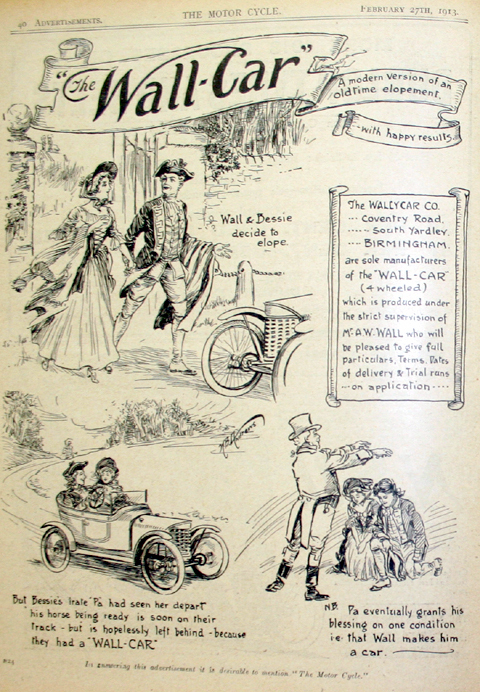 The Wallycar Company of Birmingham produced their four-wheeled ‘Wall-Car’ for a short time until WW1, and it was small enough to be included in the category ‘cyclecar.’ It may provide a further example of vehicles that competed with the early three-wheelers. But even if it doesn’t, I couldn’t help adding this delightful advert as a postscript. I hope this website gives you a feel for what was happening on our roads around 1914.